Let's see. Japan has cat cafes, owl cafes, squirrel gardens, and penguin bars. So, of course there are bunny cafes! Called "usagi cafe" (うさぎカフェ), the furry establishments have been around for a few years now and really started to take off in 2012. But don't think there's a bunny cafe on every street corner in Japan. There isn't. However, here is the side of a building that reads "bunny cafe." I don't believe the entire building is a bunny cafe. Some establishments have funny names, like "Rabbi" or "Ra.a.g.f.," which is short for "Rabbit and grow fat." Here's one called "Wonderland." Geddit? Some bunny cafes allow patrons the opportunity to purchase the animals (they're basically pet shops with coffee and deserts), while other do not. And in some cafes, the cafe part and the bunny part are separate. In others, they seem to be...less so. 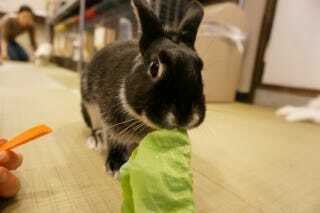 Recently, Japanese site Gigazine visited a bunny cafe called "Ohisama" in Tokyo's Shimokitazawa neighborhood. Before entering the rabbit area, you sterilize your hands and place a paper towel over your lap. This separates the rabbits from the cafe. You can see that the bunny area is populated with little, um, pellets. Celebs have visited this bunny cafe! Below, you can see various Twitter and internet users frolicking with furry friends. I sometimes feel that way. If you really like rabbits, there's a whole island filled with them in Japan. If bunnies aren't your thing, there are also islands ruled by cats.